alaTest has collected and analyzed 182 reviews of Krups Dolce Gusto Circolo. The average rating for this product is 4.0/5, compared to an average rating of 4.4/5 for other products in the same category for all reviews. We analyzed user and expert ratings, product age and more factors. Compared to other products in the same category the Krups Dolce Gusto Circolo is awarded an overall alaScore™ of 82/100 = Very good quality. 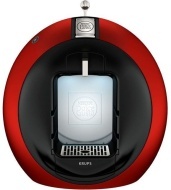 This is the third – and dare I say – the most futuristic Dolce Gusto coffee machine I have reviewed. Firstly I must thank espresso club who pointed the existence of this machine to me long before it was made available for sale in the UK. This machine is a waste of money, I live in Norway and till buying this machine have enjoyed good coffe. This is instant coffe in the capsules and the taste is awful. Monday, the machine is going back and I hope a lot more will do the same.